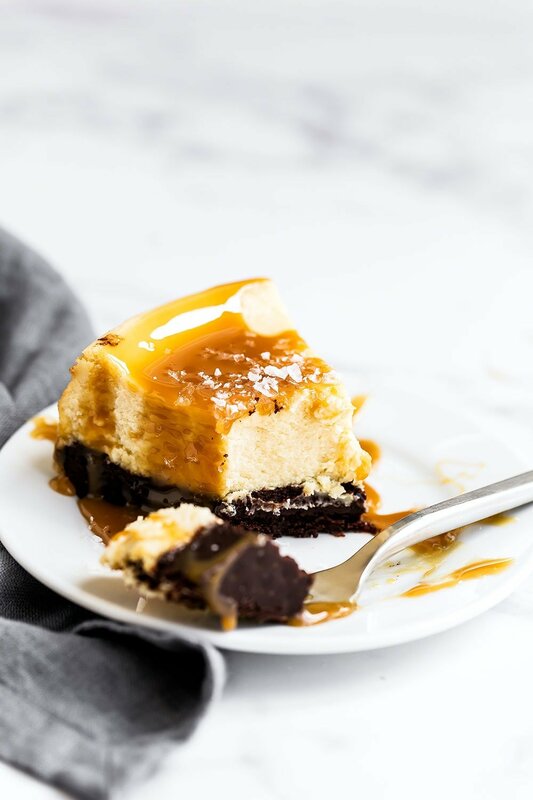 Caramel Brownie Cheesecake featured a thick fudgy brownie bottom with a luscious layer of creamy vanilla cheesecake all topped with salted caramel sauce. Every bite is heaven! Download my FREE Perfect Cheesecake Guide here! Taste: Ooooh so delightful. Chocolaty, tangy, salty, and sweet! Texture: I think this is my favorite part. I just adore the combination of the thick & fudgy brownie with the smooth and creamy cheesecake. Ease: There’s no advanced technique or skill required here (no water bath!) but you will dirty a fair amount of dishes. Pros: Fun twist on the classic dessert + can be made ahead of time and feeds a group! Would I make this again? Definitely! I find myself craving this flavor & texture combination often. You know those recipes that your friends and family ask you to make again and again for every occassion? Well I think this recipe might just be one of them. This cheesecake combines the best elements of the dessert world for one dreamy result. Every bite is such an explosion of amazing tastes and textures… I can’t wait for you to try it! 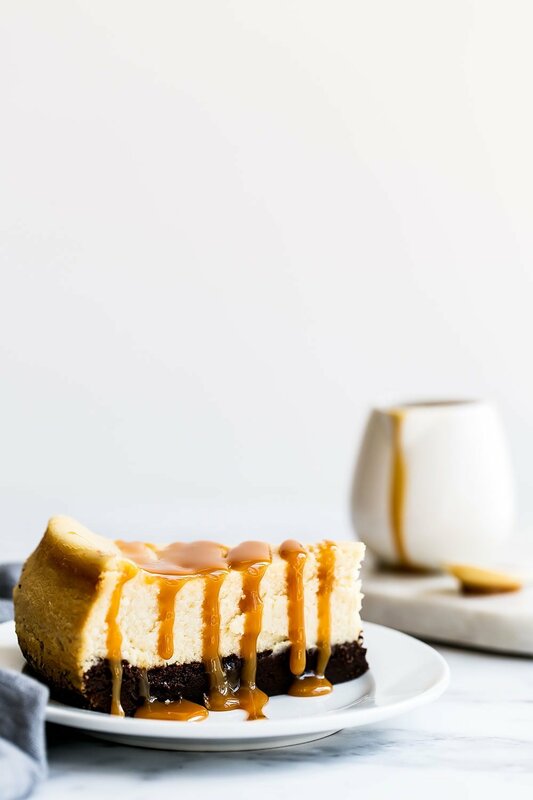 What I love about cheesecakes particularly is that you have to make them ahead of time so they’re perfecting for entertaining or serving a group. Plus they’re always such crowd pleasers… who doesn’t love cheesecake?! 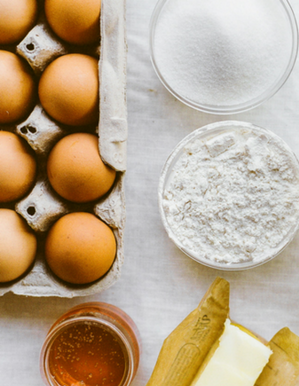 So, grab the ingredients the next time you’re at the grocery store, find a fun playlist to jam to in your kitchen, and get to baking this sweet treat! Be sure to use full fat high quality bricks of cream cheese (not the stuff you spread on a bagel). The most important part? The cream cheese should be at room temperature. This will create a smooth and creamy cheesecake without any lumps and bumps. This brownie bottom layer is super simple but creates a ridiculously fudgy and rich brownie with tons of chocolate flavor. It uses cocoa powder, so no chopping or melting chocolate. You bake it for about 15 minutes, or just until it begins to set, before adding the cheesecake batter so it cooks through completely into two distinct layers. If you wanted to take a shortcut and use a brownie mix, you can but I think making this layer from scratch is worth the extra effort! There is no water bath required for this recipe! I decided to skip that hassle because even if some cracks form, we’re covering the cheesecake with caramel which will help camouflage some imperfections. Be sure to use a quality springform pan for this recipe. To prevent cracks without the need for a messy water bath, we use the oven door trick. Once the cheesecake is almost done baking, turn off the oven but leave the cheesecake inside. Crack the oven door just slightly to allow the oven to lose some of that heat. The key to preventing cracks is to coddle the cheesecake. Any dramatic changes in temperature will cause cracks to form! If you want more tips for baking cheesecake without cracks, check out my free Ultimate Cheesecake Guide. That’s why it’s also important to allow the cheesecake to cool to room temperature completely before chilling. When it comes to baking cheesecake, it’s always better to err on the side of underbaking than over-baking. The edges should be set and dry, but if the center is still slightly wobbly or jiggly that’s fine. The residual heat will continue to cook the cheesecake even once it’s removed from the oven. 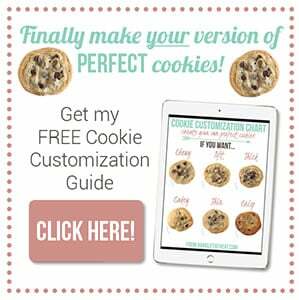 In my online baking class The Magic of Baking, I go in-depth in this concept and others so that you can bake with confidence. The hardest part of this recipe is mustering the patience to let it chill for at least 4 hours before eating! I usually like to let it chill overnight, just to make sure it’s completely set and I’m able to cut clean slices. Use a sharp knife and run it under hot water in between cuts for beautiful bakery-quality slices. Drizzle the caramel on just before serving. Store the cheesecake in the fridge for up to 2 days. 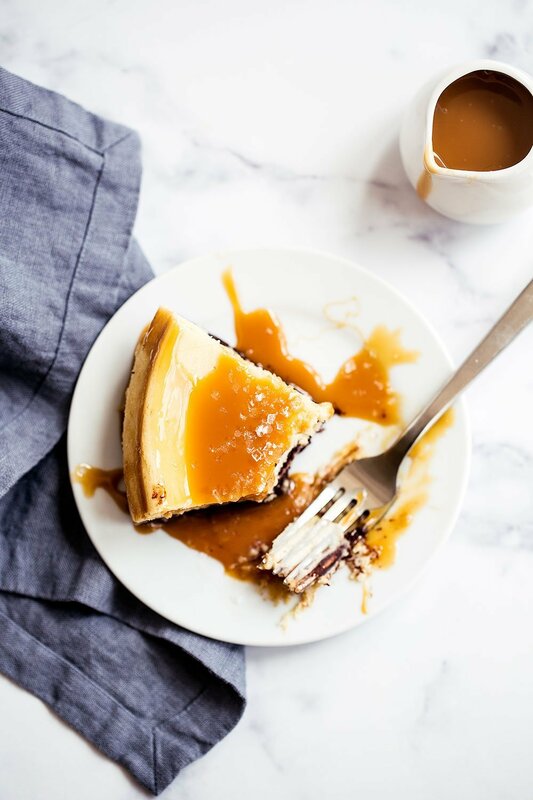 You can use store-bought or homemade caramel sauce for the topping. I have a whole blog post & quick video on how to make caramel sauce here. If you’re using store-bought, I like Trader Joe’s salted caramel sauce! Preheat the oven to 325°F. Spray a 9-inch springform pan with nonstick cooking spray. Bake for 15 minutes, or until just starting to set but not fully cooked. Let cool to room temperature then place in the fridge to chill until ready to use while you make the other layers. Maintain 325°F oven temperature if baking cheesecake layer immediately. In the bowl of an electric mixer, beat the cream cheese until smooth, about 1 minute. Add the sugar and cream and beat until well combined. Scrape down the sides of the bowl to make sure all cream cheese is being incorporated. Add the eggs, one at a time, beating just until smooth. Add in the vanilla. Pour the batter into the cooled brownie crust and tap the pan on the counter to remove any air bubbles. Place springform pan on a rimmed baking sheet and bake for about 55 minutes to 1 hour, or until the top looks slightly dry. If the middle is slightly wobbly, that’s fine. Err on the side of under-baking. Turn off the oven and crack the oven door open and allow to cool for 10 minutes (this helps prevent cracking). Remove the cheesecake from the oven to a wire rack to cool completely to room temperature. Refrigerate until completely chilled, at least 4 hours or overnight. Release the cheesecake from the pan onto a cake stand or serving plate. 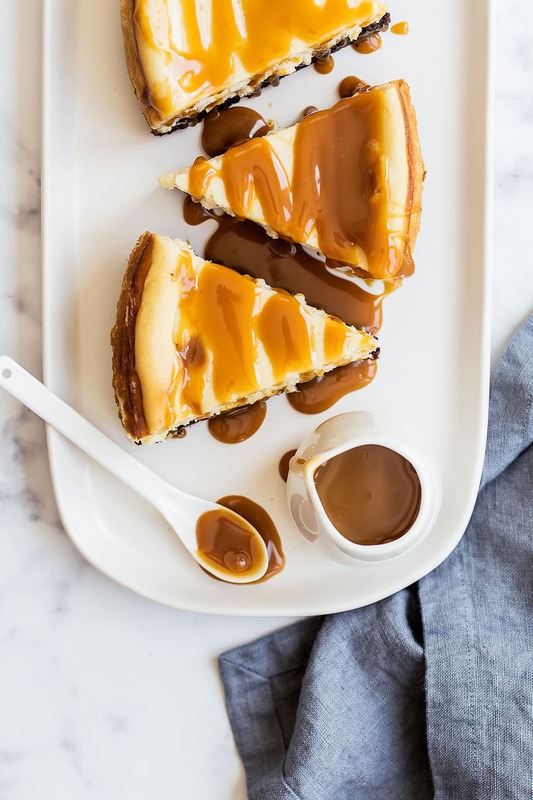 Cut into slices and drizzle each slice with caramel sauce. Serve. I am madly, unapologetically, in love cheesecake, and can hardly wait to make this!!! Yummmmmers! Hi I love this recipe, but further up you are stating that we can only keep cheesecake in the fridge for 2 days. I’ve made this recipe several times, and it has always come out perfectly! 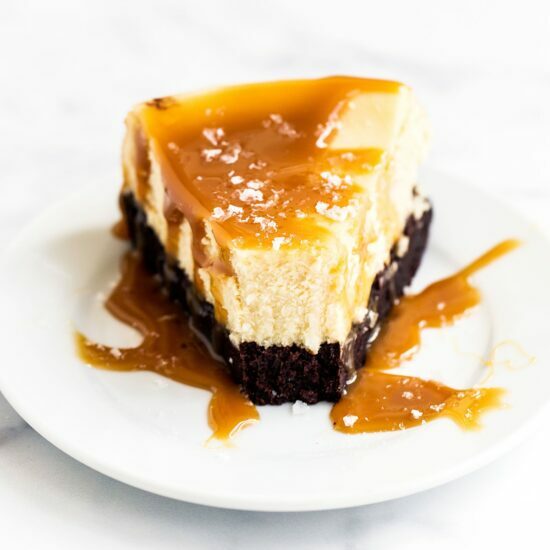 The rich, fudgy brownie with the smooth, creamy cheesecake and the salty caramel make this a perfectly balanced dessert. It is elegant, delicious and unbelievably simple to make. My guests are always sated and impressed. 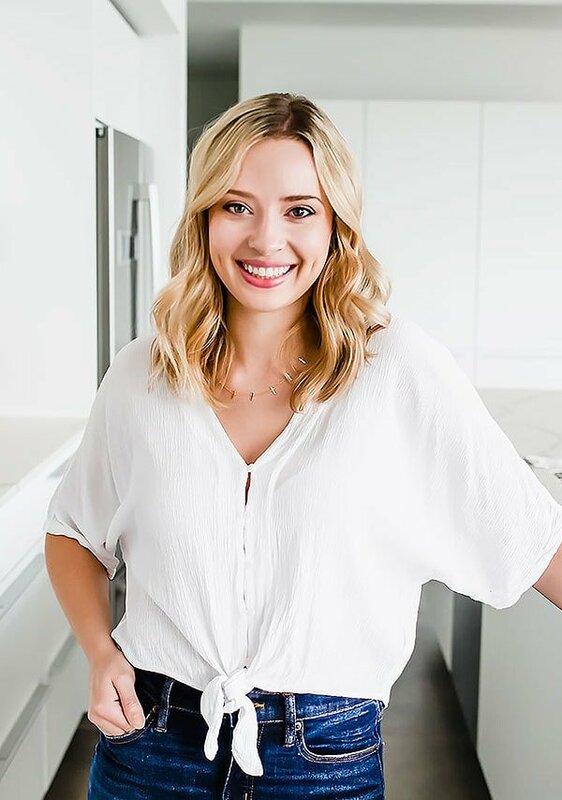 Anytime I need a dessert idea or recipe, I come to you. 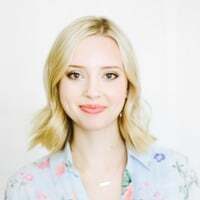 Thank you for your delicious and detailed recipes and helpful videos!